Importance. - This is the most serious insect pest of black locust. It provides infection courts for the fungus, Fomes rimosus, which causes substantial defect, growth loss, and some mortality. The only host is black locust. Identifying the Insect. 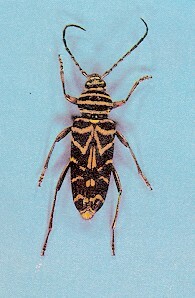 - The adult is an attractive longhorned beetle, often seen feeding on goldenrod in late summer and early fall. It has bright yellow bands expanding across a jet black thorax and wing covers, and the third band on the wings forms a "W" design. Legs are yelloworange and long. Full-grown larvae are full-bodied, pale, and about I inch (25 mm) long. Adult. (Click for detail. JPG 22K). Identifying the Injury. - The first sign of attack occurs in the spring, around the time of bud burst. Oozing sap at the point where the larva bores into the tree causes a wet spot on the bark. Eventually, the larva begins to tunnel into the wood, pushing granular frass out of the entry hole. Wood infested by locust borers can be virtually "honeycombed" by the larvae. 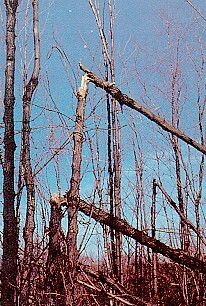 Sometimes stems are so weakened that they become windbroken. Damage caused by borers and wind. (Click for detail. JPG 46K). Biology. - Eggs are deposited in rough bark surfaces and around wounds of living trees. Newly-hatched larvae excavate a small hibernating cell in the inner bark and overwinter. In the spring, they bore into the wood, enlarging the tunnel to the exterior. About mid-July, they emerge at the original attack point. There is one generation annually. Control. - Since the heaviest attacks occur in stressed trees, most preventive recommendations are designed to encourage or maintain health and vigor. This includes planting superior trees, avoiding pure locust stands, and removing low vigor and overmature trees. Excluding damaging livestock from black locust stands can also reduce beetle attacks.